While the climate change levy and other environmental taxes make it into the mix, vehicle excise duty doesn’t. Yes, this is the Chloe Smith recently seen to be woefully out of her depth when interviewed about the fuel duty u-turn by Jeremy Paxman on Newsnight. Has Smith – or, more likely, her officials – made a mistake by omitting VED? Yet this re-definition of Vehicle Excise Duty as a revenue raiser first and foremost goes against all previous advice. VED is short for GVED. GVED stands for graduated vehicle excise duty and refers to the way the more polluting the motor, the more duty levied. A car in VED band A emits less than a car in VED band M so pays zero VED. The Treasury argues that VED, unlike the Climate Change Levy which was created as an environmental tax, is a “pre-existing tax…made sensitive to environmental concerns”. As such, in the eyes of the Treasury, VED has never been a real environmental tax and the new definition of what is and what isn’t an environmental tax takes VED out of the picture. Motormouths, such as Jeremy Clarkson, will no doubt latch on to the Treasury’s new definition. Thanks for nothing, Chloe. 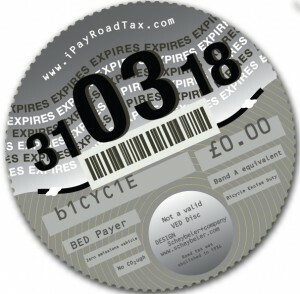 This entry was posted on Tuesday, July 17th, 2012 at 7:26 am	and is filed under No such thing as road tax!. You can follow any responses to this entry through the RSS 2.0 feed.